The trailer opens to a figure flicking some controls, which we can assume to be Han Solo, but of course if there’s one thing you need to know when watching a trailer, it’s to not get ahead of yourself. So we see a person at the controls of a ship and what I began thinking as I re-watched this scene is that the controls remind me a lot of the Empire as it has the sensible and generic black and white theme that they seem to go with. So it’s very possible that this is someone piloting an Imperial ship. In one of the Star Wars legends stories, Han Solo used to work for the Empire, so it’s still possible that this is Han Solo, if this really is an Imperial ship. It’s also possible that it’s still the Falcon, as it still seems to fit the shape of the Falcon and the controls associated with it, and the Falcon could even be a ship that is owned by Lando at the time, but he is flying it for the Empire. Another big give away of this is the fact that whoever is flicking these controls, seems to have a black sleeve, that can also be associated with the uniform of the Empire but I suppose we’ll have to wait and see. We then see the opening Lucasfilm production company logo, along with some dark music to match the time of one of the switches being flicked in the Falcon at the start of the trailer. Following this, we see Han in a speeder, and him commenting during the trailer, saying that he has been ‘running scams on the street since I was ten.’ What’s interesting about this quote is the emphasis on the ‘ten’, as this sounds to me like he’s trying to impress someone by saying this, or he’s simply trying to make it clear to someone that he knows what he is doing. The quote itself definitely seems to fit the character of Han Solo, as it portrays him as being the same scoundrel that he is shown to be in A New Hope. And the fact that he has been doing this from a young age makes it sound as if he had a tough childhood, and he only started doing it as a way of staying alive on the streets. In the scene where Han is driving a speeder, we see different shots in which it is in a dark, brownish tunnel in one shot, and it cuts to the next shot where he is out and we see the interesting looking city type planet. It almost seems like the tunnel section is a whole other area entirely, because in this area you can see a dark “browny” colour that almost makes you think of suffering and poverty, so it’s very possible that this is the first hint that this is why Han does the things that he does, to survive on this planet. Looking at the people in the speeder specifically, we see Han as the driver, and we see Quirra, who was one of the other announced characters. Han seems to be breathing out heavily in this shot, as if he’s performed some clever trick or difficult feat, and we see what’s almost a smile from Quirra as well as, potentially, relief. So we can expect some kind of awesome demonstration of his piloting skills on the ground as well as in the air in the film hopefully. The camera cuts back to a console switch, this seems to be a recurring theme, as if the Falcon being driven is what’s driving the story of this trailer, which I think is an extremely clever idea, and if the person who compiled this trailer is editing the film, then we could be in for a treat. Another cut and we’re back to the events of Han in a speeder except, this time, he appears to be pursued by some kind of Imperial soldier or bounty hunter, although it could well just be some kind of local law enforcement that is chasing him. Judging by the way that he looks back as the bike of this person chasing him explodes, we can assume that because he didn’t stop, they were after him and so we are going to get some kind of awesome chase scene which I cannot wait for. Han’s narration continues, stating that he was ‘kicked out of the flight academy for having a mind of his own’, so is it possible that he did something that resulted in the Empire’s victory but at a great cost? I really hope we get to see him in this flight academy, as it’s highly likely that it would be an Imperial flight academy, and I would like to see what it is exactly that causes him to be kicked out. So as the trailer progresses, we see another chase scene, however a new vehicle is involved. It’s possible that this vehicle is working for the same person that was on the bike, or that this is some kind of friendly race between Han and Quirra. On the other hand, it’s also possible that this is a race that determines who gets the Falcon, so it could be a race between Han and Lando, which I think would be an awesome way to do it. I know a lot of people imagined the Falcon was won in some kind of card game, but I think that a race would make for a way more exciting scene in terms of making the movie interesting, as of course the audience aren’t going to want to see a boring 30 minute card game, unless of course we just see the end of the game in which Lando loses. The trailer then cuts to an establishing shot of a snowy mountain planet, in which the camera moves through two of these mountains, so hopefully we will get to see some incredible camera shots in this film, much like the great shots that we see in Star Wars The Last Jedi. However, I don’t think that the beauty of the cinematography should be so heavily relied on for this film, as of course, it needs to keep its focus on the character of Han. So this shot of the planet fades to one of Han Solo who appears to be standing on this planet looking over at something. He could simply be admiring the scenery, but I wouldn’t take Han Solo for the kind of person to stop and look at the view, so I would say that he sees the person that he came there to meet, or possibly this is the place where he first sees the Falcon. We also hear Han’s voice again, saying “I’m going to be a pilot, the best in the galaxy.” At first I thought this was a bit too much of an egotistical thing to say, but then I realised how much of a show off Han Solo really is, so I guess it makes sense for him to want to think of himself as the best. I’m sure that if we see a scene of him in the flight academy, that he says this when he’s applying to be in it, and this is his way of trying to impress them to get the chance to be in it. So the next shots we see are of the Falcon. According to sources, this film is meant to be set around a decade before the events of Star Wars A New Hope, so if you think that it’s only ten years between the clean ship that we see in this trailer, and the dirty, rusty “bucket of bolts” that we see in A New Hope, you have to wonder what exactly Han did to make this ship so dirty, and I hope we get some kind of explanation behind it. Although I suppose, if we do, it would have to be a scene in which Lando is not in it, as there is a scene in A New Hope in which Lando asks what Han did to his ship and this sounds to me that he doesn’t know about the dirt, so therefore, Lando would have to not be there to see it happen in the first place, unless of course he was simply hoping that he hadn’t made it any worse than it already was. Regardless, the Falcon looks clean and nice inside, and I think it’s exactly the kind of ship that you would expect Lando to own, and that’s why it works for the film. We then get a look at the Falcon from the outside, which pretty much looks the same as we know it to be, at least from this angle. It’s in this scene that we can assume it is when Han officially owns the Falcon and is about to go in it to take off, unless of course, he has to fly it for some kind of mission, and this is simply him seeing it for the first time in this scene. This scene looks to show the same planet which we saw the speeder chase scene, as it seems to have the same atmosphere that the tunnel had that they went through, so it’s possible that this is the planet where the mission really takes place, and this is where they meet up. Or it’s simply where he meets Lando, possibly for the first time, and they play a game of cards/have a race, and this is Han simply having a good look at the Falcon before he pilots it, so it’s possible that he might win the ship at the start of the film, although I personally would like to see more of how Lando pilots it in this film first. Another shot, another planet. In fact, another sandy planet, which now that we think about it, seems to be getting out of hand, I mean we already have, Jedha, Tatooine, Jakoo, and even Scarif, if you would consider it a sand planet, but maybe this one will have something unique about it, we don’t know, so I won’t judge it just yet. This time we see a character walking, who appears to me, to be Han Solo, and what’s also interesting is the structure in this shot, and I hope that we will get to learn the history of this in one of the visual guides, that will likely be released following the release of the film. As the camera moves, it appears that there are actually two people in this shot, almost confirming that it’s Han and Quirra, unless of course it’s Lando and Quirra, but of course if we don’t know if there is any relation between those characters, so we’ll have to wait and see about that, but it’s obvious that they are traveling to meet someone, unless the structure in the shot, is in fact a ship, and this is what they were sent to pick up, which I find unlikely as it looks even more unappealing that the Falcon in A New Hope (sorry to any die hard fans of the Falcon). The camera then fades to a shot of Woody Harrelson’s character, Becket, inviting Han to go on some kind of crazy adventure, although in this shot, he’s only really saying to Han that he is putting together a crew, so this part of the trailer may be trying to redirect our attention from something else that is happening in this scene. So anyway, in this shot we also see water, which is one thing that we don’t usually see on these sandy planets, so that’s something different, as well as the rock structures around Becket, so it’s possible that he has some kind of interest in history, or there is some kind of money to be made through the history of these structures, and this has something to do with the job that he is giving Han, who knows? So following Becket’s line stating that he is ‘putting together a crew’, we see the different characters of the film to give us an idea of the crew, and this kind of gives a Fast and Furious feel to it, given the fact that we know that Han and Lando will be close friends by the end of this film, or possibly just friends that have some kind of tension between them and the fact that there is a crew that’s needed for a certain job makes you wonder if Han becomes friends with all these people, or if they actually end up leaving him because they don’t trust him, which I think would create a very interesting dynamic for the character. The first character we see following this is, appeared to me at first to be Emilia Clarke’s character of Quirra, but of course the costume makes you wonder otherwise. However it could be that this is simply showing her in some kind of Imperial uniform in which she meets Han. Or possibly this is some kind of disguise that she has to wear to get into some kind of Imperial party, as there are some parts of the costume that seem to have a party feel to them. Then we see a shot of Lando, played in this film by Donald Glover. I have to admit, in the shorter version of the trailer, I wasn’t sure if the director’s portrayal of Lando would be how I imagined him to be, but seeing him in this costume makes me rethink this, as the slightly dark colours of the costume seem to fit the old, style of the time of making Empire Strikes back, and therefore fit the style that Lando seems to follow in that film. I really hope that this film builds on the relationship between Han and Lando, as I personally really like Lando as a character, and seeing as we don’t get to see him in the newest trilogy, and we still don’t know much about him by the end of Return of the Jedi, I would love to find out a bit more about his backstory, as well as Han’s. It’s very possible that in this scene, Lando and Han are playing cards together, judging by the confident smile on Lando’s face as well as the fact that he is sitting down, although this could really be anything, he could just be sitting down for a drink. But I also wouldn’t mind if this is a scene in which Han meets Lando for the first time, which I think would be amazing if it were the case that they just ended up instantly being friends by drinking and telling stories or something like that. Following this we get a shot of another character who appears to be loading a weapon of sorts. This character looks very similar to the character from the comics that appears to have gotten married to Han at some point and, if this film involves her trying to find him, that could be interesting, especially if we see her trying to cause some friction between Han and the ‘crew’. it’s also quite possible that she’s simply a member of the crew with a dark past as, in the shot where we see her, she seems to be angry over something. Maybe she could, for some reason, hate one of the other members of the crew, which may be Han Solo, and somehow she ends up working with him and she actually is his wife, which could definitely make things interesting. There’s also a weird monkey looking alien, taking the controls of the Falcon, I’m not entirely sure about the choice of creature, as it seems uncomfortably similar to a monkey, but of course we’ll have to see how this character develops to see if this character was a good decision for the story. After this we see another interesting shot that looks to be Han Solo looking over a table or a simple gathering of sorts. But since I’ve talked enough about the game between Lando and Han, I’ll move on because the next shot we see is pretty important, as it’s the first time that we actually see Chewie in the trailer. The style that the costume designers have given him makes him look a whole lot younger which is just great because it shows us a take on Chewie that we haven’t seen before, one that seems to be more detailed. It helps that it is a different actor, making it more believable that he really is a younger Chewie, so I’m glad that they chose Joonas Suotamo, as much as I like Peter Mahew. We then hear the lines from Becket asking if they’re ‘in’ and Chewie answers for them with a simple growl, with Han translating for him to say that he said ‘yes’. It’s interesting that Chewie can speak for both of them at this point; it really makes you wonder what led them to this point in their friendship, maybe they just instantly formed a strong connection because Han saved him from slavery by the Empire, like in other legends stories, or it could just be that they are already good friends by the start of this film, which would be disappointing as I think it would be great to see them meet for the first time. So following this, the camera shows us a shot of what appears to be (judging by the sleeve we can see) Lando and the droid that we saw with the person I thought to be Quirra, earlier in the trailer. I personally really don’t like the design of this droid as it reminds me too much of the robot from the old Power Rangers TV show, but we’ll have to see how he handles himself in a fight before I judge him, as I never thought I’d really like K2SO in Rogue One, but I ended up loving him. So after seeing Lando and the droid together, we finally get to see Lando piloting the Falcon. This leads me to the think that we will see Lando owning the Falcon for possibly the first part of the film as I don’t believe that after winning the Falcon, Han would just let Lando use it for a bit. Next we see a scene in a party of sorts in which Quirra and Han are both there. It’s possible that Han tries to flirt with Quirra, with him being the scoundrel that we know him to be, and this could be his chance to do so through him dancing with her. It’s more likely that they are there as part of the mission, as this film seems to focus a lot on this job, so I believe that this is them infiltrating the party in order to find someone or something, so look forward to seeing what happens in this scene. We also see Quirra saying that she ‘might be the only person who knows what Han really is’, which is interesting because it leaves us wondering if there is something about Han’s personality that we don’t already know. It’s possible that he may have done something really horrible but I just hope that it’s not something blatantly obvious, like the fact that he used to work for the Empire, although this is very likely, but the quote makes me curious enough to make me watch the film, so we’ll have to wait and see what this is. What we see next is quite interesting, as it looks to be Han, with his blaster at his side, at an interesting angle, with a group of savages who appear to be a gang in the background. What’s interesting about the angle is it’s an angle often used in the kind of “Mexican standoff” that we know famously from old western movies. This makes me think that Han maybe challenging one of them, or possibly intends to kill all of them. Maybe this is what Quirra meant by knowing “what he really is”. Of course the group could simply be another group that he has scammed and they have showed up to where he is, in order to demand their money, although we’ve already seen that in The Force Awakens with Kanjiclub and the other gang of which I’m not familiar. What makes me think that he might be intending to hurt them first you may ask? Well, also in the background is a settlement of sorts that almost matches the kind of settlement that the sand people from A New Hope lived in, and they were known to be savages, and this would make the settlement in this shot match the costumes of the beings that are also in the shot, so I believe that Han thinks it would be the lesser evil to “shoot first” in this case (as with Greedo). In the next shot we see a ship that doesn’t appear to be the Millennium Falcon, and a dark cloaked figure fighting what appear to be bounty hunters of a sort. It’s interesting is that the figure is cloaked, it leaves us wondering who this person is? Is there a traitor amongst this crew or is this potentially Han Solo? This is one of those things that really has me wondering about this film. Of course we had a dark figure in Rogue One shown, who just ended up being Vader’s servant, but we haven’t seen any clue of there even being a Sith or Jedi in this film, so even if it isn’t a traitor, it could still be an interesting new hero or villain, which is why I’m pretty sure we will get some satisfying answers to these questions when the film finally comes out on 28th May. Up next is potentially a fight sequence with this “power rangers droid” which could end up being pretty interesting. I just hope we don’t see him do the exact same thing that the droid K2SO already did in Rogue One, because I’d like to see a droid bring something fresh to the table in this and in future Star Wars films. We then see a cut back between a chase scene and Quirra finishing the quote of “who knows what you really are.” The fact that we see Han controlling a ship that’s escaping others whilst this quote is being said and then we see a ship flying away from an explosion, we start to wonder if Han Solo simply leaves this crew behind on this mission. This is a completely plausible idea as we have no reason to believe that many of them can die in this film, the only ones that we know will survive are Han, Lando and Chewie. I honestly think it would be very interesting if something like this were to happen, as I believe it would be something that fans would debate over, such as if he really did the right thing or not, as it may have been a case of try and save them and die, or just leave. We then see Han smiling and saying “and what’s that?” and it’s both this quote and this smile that gives me the confidence that this actor can pull off the role, as it’s this kind of showing off smile that fits Han Solo perfectly, and the fact that he doesn’t know “what he really is” really shows that he is a scoundrel who only hears what he wants to hear, and thinks of himself as the best “pilot in the galaxy”. 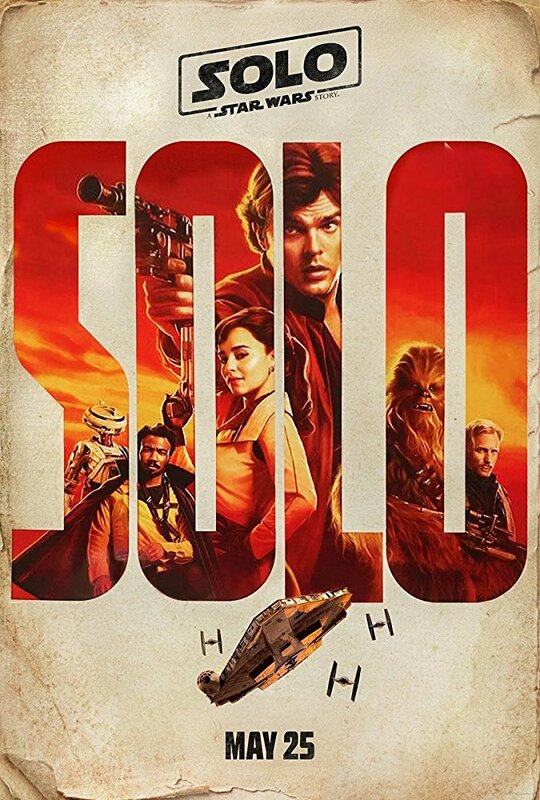 Finally we get to see the Solo logo followed by one final scene that just puts the icing on the cake perfectly. A shot is shown of the Falcon being chased by Imperials as well as avoiding a giant creature of sorts and a sort of tornado, that meets a description of the Kessel Run’s short cut (according to sources). So this tells us that we are likely to see the Kessel Run in the film, which is just fantastic. And we hear Hans optimistic lines of “I thought we were in trouble there for a second, but we’re fine”, not only adding a comical moment to the trailer but also matching the overconfident Han Solo we got to see in Harrison Ford, when he would perform crazy tricks like going into an asteroid field, or standing up to a Hutt that’s about to execute him. This also makes me think that Han will be not only be the cocky one of this film, but potentially the stupid one, which I’m not saying is a bad thing at all, I just think that he is going to be the one that makes the jokes that really moves the film along smoothly, and help to develop his character more, by showing us how much Han changed after he met Leia. Overall, I think that this film is going to deliver a new and more exciting time of Han’s life, and after analysing the trailer, I think that the questions that the trailer throws up are enough to leave us in anticipation for the film. 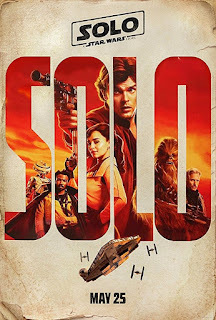 I’m definitely looking forward to this one, and I believe that this film may make me like Han Solo more as a character as we learn more about him.